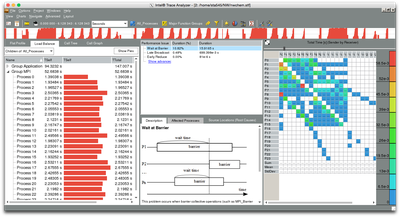 Intel Trace Analyzer and Collector (ITAC) is a tool to collect and graphically analyze behavior of MPI applications. It helps you to analyze communication patterns of your application, identify hotspots, perform correctness checking (identify deadlocks, data corruption etc), simulate how your application would run on a different interconnect. ITAC is a offline analysis tool - first you run your application to collect a trace file, then you can open the trace in a GUI analyzer to view it. The trace will be saved in file myapp.stf in the current directory. The GUI will launch and you can open the produced *.stf file. Refer to Intel documenation about usage of the GUI tool.